It’s that time of year where the sports fans are going wild and there’s a game on almost everywhere you look. There’s no better season to gather family and friends than during the fall, so grab your favorite people and throw a party to watch your favorite team. To throw the perfect game day watch party there are a few components you will need. You’ll need a place to watch, something to watch on, people to watch with, something to drink, and something to eat. A big flat screen TV or projector are the most widely preferred methods of watching the game. When you’re throwing a watch party you’ll want to make sure that you have enough space for everyone to sit comfortably and see the TV since it’s really all about the game that day. You’ll also want to make sure that everyone is well fed and has something enjoyable to drink. 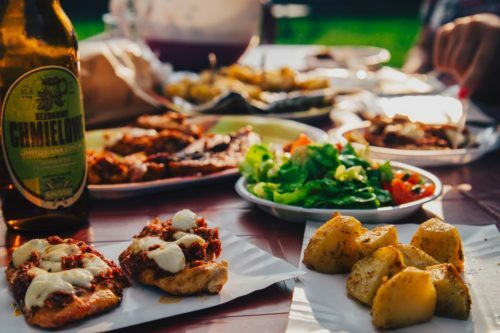 The food and drinks can really make or break the watch party since your guests will be expecting something delicious to accompany their game watching. Pizza, wings, beer, and soda are popular game day favorites. It’s easy to find the best pizza and wings in Las Vegas at Joe’s New York Pizza so that can be your one stop shop for picking up food for game day. For the pizza, it’s probably a safe bet to order plenty of cheese and pepperoni pizza since these are traditional crowd pleasers. When ordering the wings be sure to order a variety. Flavors like mild, medium, spicy BBQ, and lemon pepper are usually hits. You can even throw in some cheesy garlic stix and baked potato fries for sides that are sure to be delicious. The drinks are also an important part of any game day. People love relaxing and watching the game with an ice-cold beer or soda in hand so be sure to pick up a few packs of your groups favorites. Don’t forget the ice, plates, cups, utensils, and napkins as well! With the right group of people, a thrilling game, delicious food, and refreshing drinks you’re sure to have the best game day watch party out there! This entry was posted in Blog and tagged Game Day Food, party, pizza on December 13, 2017 by Peter Soltesz.